​Commercial garage door installation is a project not to be taken lightly. The person undertaking the job should be mechanically experienced and have the correct tools needed to properly install the door. The longevity, ease of use, garage door opener, etc. are all greatly affected by the actual installation of the garage door. Garage door openers are not only convenient, but they also keep your home and family safe. Installation is best done by two people that have some degree of knowledge of tools and such. It is highly recommended to hire a professional installer due to warranties on the installation and opener, and the professionals will level your door, grease the rollers and other things often overlooked by the average consumer. Garage door replacement is recommended if your door is 20 years old or older. Newer doors are safer and easier to operate. Replacing your garage door is not without risks, and it does require mechanical knowledge, special tools, and additional help from another person. New garage door installation requires mechanical knowledge and can be strenuous for even an experienced do it yourselfer. Keep in mind the company which you purchased your garage door from will have professional installation available which will most likely be worth the extra cost. Garage door panel replacement can be done considering your garage door manufacturer is still making your specific garage door. If you can't get an original panel for your particular door, it is recommended that you either repair your current panel or replace your garage door. Call your local garage door company with the brand and model of your current garage door and they can assist you in getting the panel you need, and installing it. Garage doors come in four basic types. Swing up, swing out, roll up, or slide to the side. Then you choose from single, double, double wide and then choices of colors, material, etc. The most popular garage door is the roll up. Your garage door positively adds curb appeal and has a major impact on your homes appearance and value. Homeowners get at least 87 percent of a garage door investment back if they sell their home. 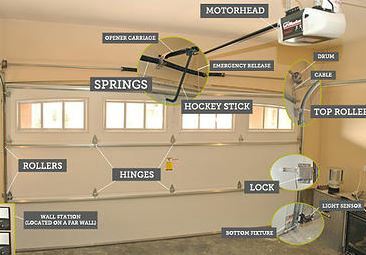 ​Garage doors need always to be secure and easy to open automatically or manually. The make and designs should be neat as most garages are in the front of the main entrance while others are at the back away from the public eye. Whether making a new door garage or repairing the existing one security, and lock features appears to be the important one. COMMERCIAL DOOR INSTALLATION: This is a sensitive door because of the security details attached to it and the public usage it ought to serve. We give priority to such doors for the safety and security details making it remote open and close this eases those guarding or security personnel around. Considering the wear and tear is fast due to public use, regular servicing is vital. Installing the doors should have the maximum height of vehicles indicated to give direction and to avoid damages. These are common in public underground parking and vehicle reservations. GARAGE DOOR OPENER INSTALLATION: We install garage door openers in the appropriate position and side of your choice. Our experts take with them the necessary tools and thus equipping the best and know how to install garage doors. Openers especially those that are controlled by a remote can spoil or break the springs. The weight of the material make of the door can easily spoil the openers. Our experts install the right openers depending with the material make of your door, and the open style. GARAGE DOOR REPLACEMENT: We replace garage doors repair them whether manual or automatic openers. The fault doors can be dangerous when the screws become loose if not welded permanently. Wearing out, will require replacement as the door becomes faulty and fail to open to force to open. NEW GARAGE DOOR INSTALLATION: New garage door will involve the technical work and this will require to have the best team in place. We offer the best ground work in matters concerning the new garage doors. From selecting the material, balancing and alignment, function and connection will entirely make your garage one of the best. You have the choice of manual or automatic remote control to open at a distance. The door must be level with the walls and also the floor. PANEL REPLACEMENT: Panel replacement can be done on the damaged section without altering the whole door. However, you can contact us to repair your door though the extent of the damage will differ with the cost. If the panel section damaged is more it would be great if your whole panel is replaced because the cost of repair will be equal to the cost of doing the whole repair. TYPES OF DOORS: Garage doors vary with size, function and material make. They vary with the mode of opening whether manual or automatic. Each type of door will fit the openers, panels, and the type of track to install. The open style is also important, the swing up, swing out, roll up and slide to side. The intention is clear and therefore you have the choice of selection.